Jun Shihan Roger Esposito began his karate training in 1990 at the Seido Karate Dojo in Staten Island under Jun Shihan Ed Ellington. In 2007, upon Jun Shihan's retirement, Jun Shihan Roger, who had been teaching for over 10 years, was appointed Branch Chief Instructor for the Staten Island dojo by Seido founder Kaicho Tadashi Nakamura. He is a four-time kata and kumite Seido Benefit Tournament Champion and in 2002 traveled to Japan to compete in the All Japan Seido Tournament. He continues to study with Kaicho Tadashi Nakamura at World Seido Karate Headquarters in New York City. Lauren began training in Seido Karate at age 10 in 1994 under the direction of Jun-Shihan Ed Ellington. Seido cultivated in Lauren a deep love for karate and the ancient culture and traditions of Japan. In 2006, she moved to a rural Japanese village on the island of Shikoku called Ainan. There she taught English to school-aged children and practiced Seido with Jun-Shihan Toshi Sawahira. 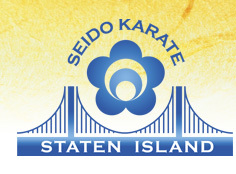 Upon returning to the U.S., Lauren continued her Seido training under Kyoshi Roger Esposito and helped to teach the Seido Staten Island Children's Program. She is very grateful for all the support and guidance her Seido teachers have given her.